Tom Verducci, in an article on the Spawn of Boras Bryce Harper, mentions that the Nationals averaged only 12,000 households viewing each home game last season. It occurs to me that the Nationals may be the only team in the country where the “fanbase” is more likely to go to a game than watch it on TV. After all, the Nationals to a certain extent positioned their new stadium as a prime location for D.C. power players to sit in a luxury suite and pay half-hearted attention to a baseball game while discussing the future of our Great Nation. If the Nationals were “hot” (say, with Stephen Strausberg, Bryce Harper, and the Zimmerman(n)s leading the way), the Nationals would have access to a unique audience base with a lot of money and not a lot of interest in the team. 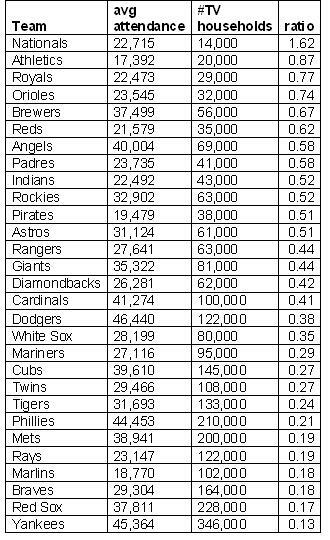 The Nationals were the only team who averaged more fans in the seats than households tuning into the game. The Yankees and the Red Sox, with the TBS-bolstered Braves, were at the bottom. The Marlins and Rays both had two different cable networks showing their games, which increased their household viewing numbers. I don’t know enough about that television situation to know whether I interpreted that correctly. The sources I used did not have TV numbers for the Blue Jays. Some other interesting aspects of this data. Much has been written about how a new stadium no longer “saves” a team beyond a few years. Frequently-cited evidence of this has been dropping attendance in Baltimore and Cleveland. Yet they rank 4th and 9th respectively in ratio of game attendance to tv audience. This suggests that perhaps their beautiful ballparks are still saving them from an even more precipitous decline in fanbase interest. Note: this is reposted from my personal blog.